and engage more effectively with your donors. An entire suite of fundraising and marketing tools at your fingertips. eGo Connect provides a suite of incredibly powerful tools that will help you strengthen and expand existing relationships, build new ones, organize internally and generate more money. Customers small and large use eGo Connect to scale rapidly and efficiently. Save money by replacing multiple tools with a single platform. Generate donations faster than ever with text and web giving. Easily sell tickets and manage your events and fundraisers. Monetize your physical and digital download products. Automate follow up, personalize messaging and engage donors. Directly engage your donors on their mobile devices. Engage live audiences with surveys, discuss feedback and collect data. Auto collect data and distribute information at scale. Admin and reporting features for both donors and administrators. Personalized setup and strategy included. From the moment you set up your free trial, we hold your hand, help you build strategies to further your objectives and walk you through the use of your new tools until you are comfortable and can operate on your own. Additional ongoing consulting is available upon request. We removed all the fluff and built an easy to use platform that focuses on the following key areas. Accept recurring donations by web and text message, organize events and sell tickets, setup an online store to monetize your physical products and digital content. Build your relationships on a large scale. Communicate consistently with subscribers, donors or volunteers based on past activity, interests and more with our automated email and text message tools. Use our interactive tools to help you gain more donors and subscribers. Extract valuable contact information and data from live events, social media, run live surveys and more. Organize your internal systems. 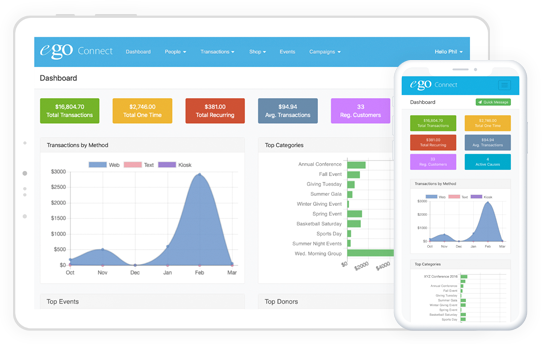 eGo Connect can help manage subscribers, donors, plan campaigns, track progress, run reports and more with speed and efficiency.